"Curses, family secrets, a girl who clings to life after disaster, and a danger that rages out of control, affecting families, destinations, and a power struggle...a solidly engrossing read packed with twists, turns, and well-drawn characters." Fifteen-year-old Elizabeth Yale clings to life. 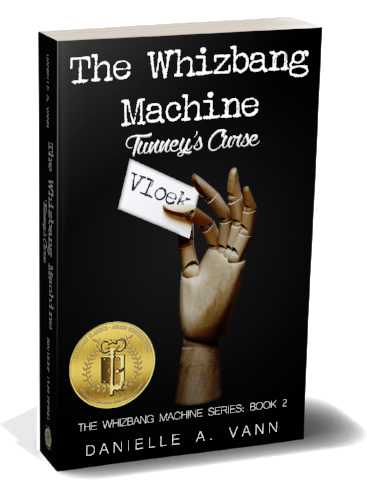 Her plan to save the Whizbang machine backfires. As her grandfather Jack feverishly works to save her, the Whizbang factory begins to topple down around them. Narrowly escaping, the pair realizes the Whizbang machine is missing. As Tunney's curse rages out of control, no one in the quaint Dutch town of Leiden is safe, and no one is free from suspicion either. Jack and Elizabeth must follow the clues Elizabeth's deceased father, Jesse, left behind to unravel the secrets of George Tunney's shady past and stop the curse. This all must be done before Elizabeth's mother's 40th birthday―which is mere days away. As they dig, the pair, alongside Detective Henry, are sent on a wild chase that takes them into the dark underbelly of the Netherlands, into the city's canals looking for a sunken clock, through the private chambers of a Queen, and into the dark face of danger. Each new secret exposed deepens the mystery. Will they gather the clues and stop the curse in time? Is someone among them really working for the other side? Will someone fall to the curse once and for all?